When Would NDC Learn Its Lessons? ...And would some of its members still call Mr. Rawlings as Talkative John’? A troubled-party runs away with its tail in between her legs. As a loud-mouth legislator sprays the atmosphere with what I call gun powder residues. The party fears backlash from the populace and it’s distanced itself from unsavory remarks made by one of their own. Many were in Somanya over the weekend, but what one man said during a radio interview after National Democratic Congress (NDC’s) ‘Unity Walk’ in the bustling eastern region town has put the whole party under a microscopic view. Member of Parliament (MP) for Odododiodio, Edwin Nii Lante Vanderpuye had told Citi FM an Accra-based radio station that NDC would bounce back to power in the 2020 general polls, thus it could free incarcerated former law-maker Abuga Pele jailed six years for causing financial loss to the state. “It is unfortunate but I can only say that this will not dampen the spirit of the NDC. Between 2001 and 2004, they sentenced Tsatsu Tsikata, Dan Abodakpi, Ibrahim Adam and Kwame Perprah. It did not stop us from winning elections in 2008. We are going to win the elections and bring Abuga Pele out,” he told an Accra-based radio Citi FM after the party’s Unity Walk. That statement has since been viewed by many as absurd and imprudent. 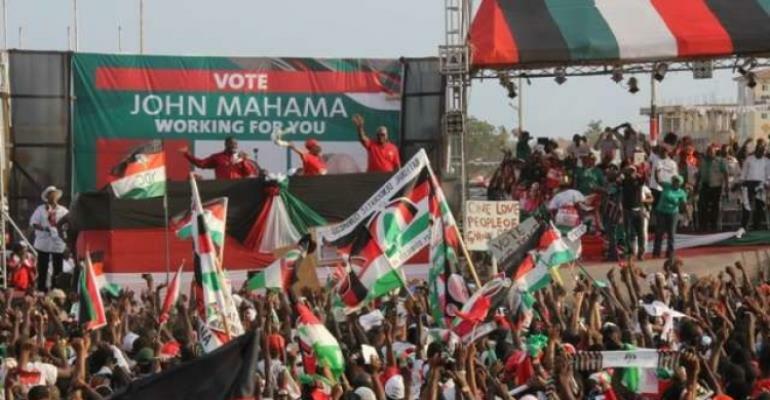 The party has categorically stated that the MP’s sentiment does not reflect NDC’s position. “It will be absurd that after a successful conviction has been achieved in this particular case, the initiator will turn around to free any person who has been convicted as a result,” Johnson Asiedu Nketia NDC General Secretary said in a statement issued on Monday 26 February 26, 2018. At times it takes a tweet to sound a warning to the rogues. And perhaps the simple message must read:-Enough is enough. I think loud mouth Edwin had better learn to stop muddying the still waters or he’s going to find himself with a huge trouble with the party’s leadership. Be reminded still waters run deep. Former President Jerry John Rawlings has spoken again. And I’m pretty sure the naysayers have already trashed his talk. Of course they are good at it, just like the ancient people mocked biblical Noah ---years before the deluge. And just like the ‘hawks’ (power-brokers) in the NDC ‘binned Mr. Alban Bagbin’s advice and littered Tony Lithur’s counsel. “Stealing and corruption puts no one above the law. Those who have committed crimes deserve to be punished, Rawlings tweeted in a post he titled ‘Political Power Not for Freeing the Guilty’. If the quest for political power is to release wrong doers from prison, then the NDC is laying its own foundation to remain in opposition for a long time,” President Rawlings said. Indeed, the man who trumpeted probity and accountability in the days of the 1979 and 1981 revolutions appears so upset about the way things are going. “Obviously the corruption by some of those who were in office resulting in a humiliating defeat in the last election does not appear to have affected their conscience and reasoning in any way. The NDC needs to regain its moral compass. A party born out of the explosive circumstances of our past should not find herself so HIGH on the scale of corruption,” former president Rawlings reminded the party faithfuls. And I couldn’t agree with Mr. Rawlings more on his assertion that some individuals don’t deserve to be in the party. Isn’t he right? I think it is outrageous for a lawmaker to make remarks that tend to undermine a court of legal jurisdiction that handed sentences to public officials who’d willfully caused financial loss to the state. Who can claim he loves Ghana yet wants her broke or pillaged? Who does that? Except that individual is a nation wrecker, a saboteur and a traitor. Except someone who hates the progress and development of Ghana. Yes, except that individual is selfish and egoistic. Don’t forget, this is a nation that we all have a stake in. And you think Ghanaians are fools. We don’t close our eyes when we go to bed. Pele was handed a four and six-year sentence which will run concurrently whilst Assibit got concurrent sentences of 12 and four years on different counts. The court also ordered the state to recover all assets and money belonging to the state from the convicts. Philip Assibit has since served notice he would be appealing his 16-year jail term alongside an application for bail.